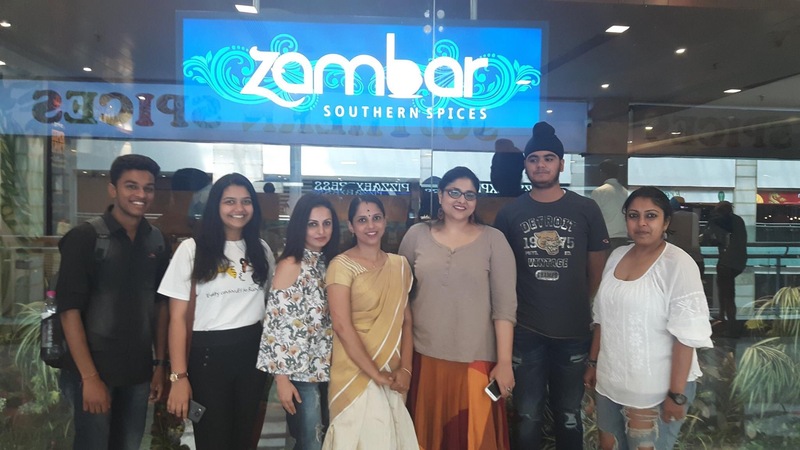 The Vishu (Malyalam New Year) special at Zambar showcases some of the best Malayalam celebratory traditional food and promises a good break from the fast food flux we encounter thanks to the mall culture. It’s just the first week of April and the sun is shining in all its might which isn’t exactly an appetite inducing situation. As the reached Zambar, AmbienceMall for the Vishu food festival preview, we had a similar predicament. It only look a whiff of the menu and the laying down of a fresh green banana leaf for our appetite to crawl out of its heat induced slumber. We geared up for rather lavish meal traditionally known as Sandhya with over a dozen dishes/food stuff and two deserts between rounds of hot rasam and a rather refreshing coconut water based Mojito. 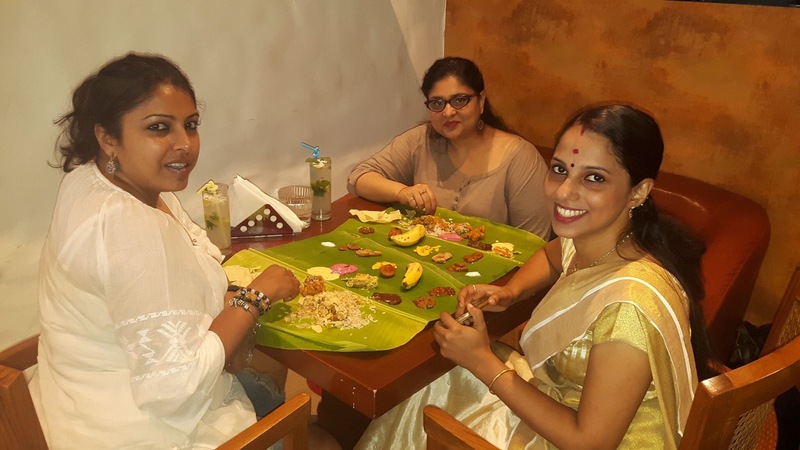 The dishes that were served to us are from Alleppey, the hub of Kerala backwaters which is also Zambar’s Chef Remya’s hometown. The menu is almost identical for all Malayam weddings, so in short this menu is THE celebratory menu of the land. Our leaf platter was bejewelled with sweet and savoury side items along with two types of pickles (mixed veg & ginger), Papadum, Banana Upperi (good old banana chips) a , Unniappam (sweet deep-fried, jaggery , ice & coconut based fritters are served after prayers as prasad) one of the essential dishes of a Sadhya meal and a banana (sure we wondered why!) and some ten food items were served shortly alongside these. And now it’s was time for the main course: the course is centred around parboiled Kerala Matta Rice/ Red or Brown rice (both high in fibre and nutrients, chewy and retain bran as they are minimally processed). The meal begins after the rice is served topped with Sambar on one side and Parippu Curry (main or the main daal based dishes of a Sadhya) along with rasam and Morru Curry (Buttermilk curry seasoned with spices) and of course lots of ghee on top. Here’s a dummy’s guide to dive in, start with mixing the rice with either above mentioned dishes, break and add papad and make your way in by combining other dishes and sweet and savoury delights with the rice, sambar, curry and papad mix. The second step is to head to the mango pickle followed by Sarkara Varrati (Banana & milk based fritter coated with jaggery), banana chips, ginger pickle, Unniappam, Kootu Curry (roasted coconut, banana & black chana), to cut out the spicy flavour of Kootu Curry, they serve Pachadi (made with beetroot & curd), which is sweet to taste along with Kaalan (another yoghurt, coconut and vegetable -based side dish). Other basics include the spicy Theeyal (quite similar to Sambhar, this one’s based on roasted coconut, contains fiery spices comes with lots of drumsticks & tiny onions), Thoran (stir-fried veggies), an essential everyday food item in Kerala and Morru Curry (buttermilk & coconut curry), & Olan (made with either Ash-Gourd or black-eyed peasants, pumpkin) along with everyone’s favourite Avial (coconut based, mixed veg stew). Don’t forget to top it all with copious amounts of ghee and head to gage sweet & sour ginger-based Inji Curry which aids in digestion after this hearty meals. And the ripe banana which was served to us finally came to its conclusion with the delicious Adda Payasam (tiny parcels made from rice flour jaggery, coconut milk) which is considered on of most premium deserts from Kerala and of course the creamy Malayam kheer or Pal Payasam (milk, ghee & rice). Up next, a shot or two of salted and mildly spiced butter milk is a must, if you wish to walk away rather than sleep on your designated table, thanks to this heavenly delectable meal. PS: I waited for a bit to give my stomach a little rest and got myself a nice filter coffee to wake up. It’s impossible to recommend just a couple of, dishes from this festive thali. Everything on that leaf works towards a fantastic experience. If you’re still confused watch the video above, where Chef Remya breaks down the massive meal for the uninitiated. The Vishu special Sandhya menu will be available at Zambar , Ambience Mall, Gurgaon on April 14th, 2017.